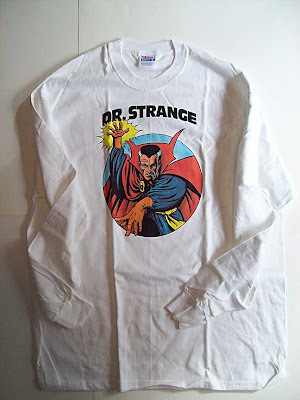 Welcome back, to this, Part 2 of a series of posts that will seek to catalogue my extensive collection of Doctor Strange (and related 6-Dimensions characters) apparel! can be found at that link. 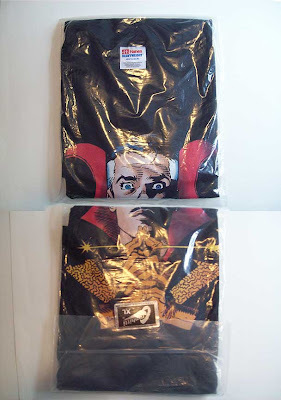 Today's installment deals with the meat and potatoes of my Doctor Strange apparel collection - the T-SHIRTS! However, since I have so darn many of them, I have to divide them all into three groups. Today is Subsection A : Dr. Strange SOLO Appearances (meaning; shirts that have Dr. Strange and ONLY Dr. 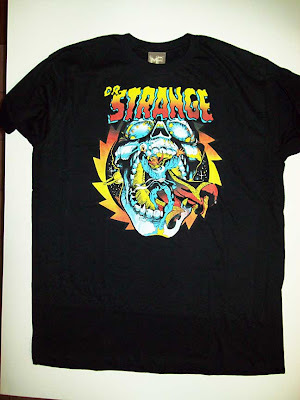 Strange on them - and mostly only officially released product. I'm not usually interested in knock-offs or home-made items)! We'll start off with the very FIRST Dr. 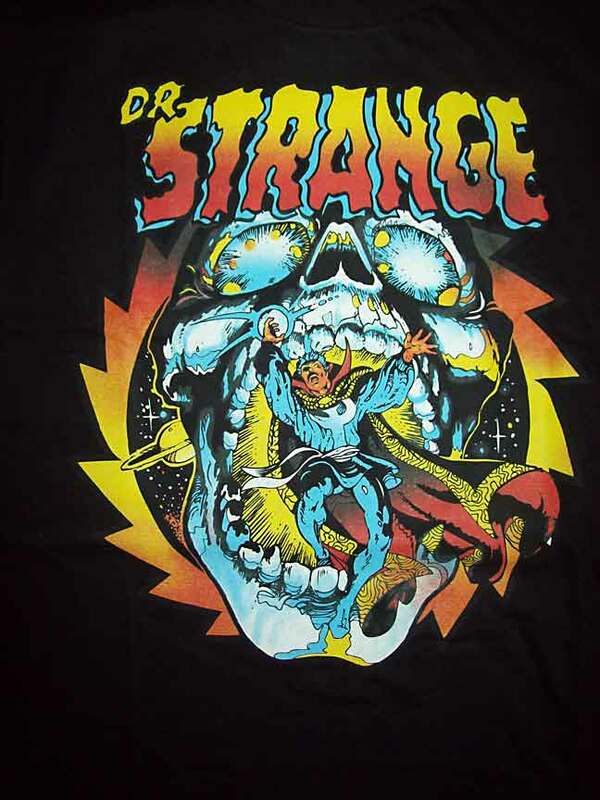 Strange T-Shirt design, the classic version drawn by Steve Ditko! As you'll see in this post, like many of my Dr. Strange shirts, I have two of these. 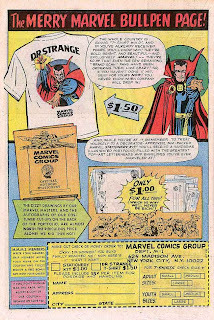 Take a spin on the Way-Back Machine and look at one of the first advertisements that ran in some of the Marvel Comics issues in 1965. Amidst the many other Marvel collectible swag, Dr. Strange hawks his own shirt. And it could have been YOURS for $1.50. Truth to tell, I don't actually own the real, authentic 1965 Marvelmania edition of this item. Sadly, no. (Nearly every attempt at procuring one ends with the shirt selling for hundreds of dollars - and without winning some sort of lottery, I am unable to justify that.) What I do have is the re-issue that was released in the 1990's by Graphitti Designs. 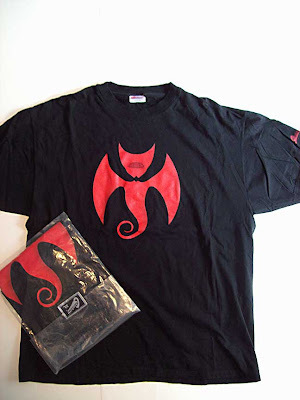 In the early 2000's they also released the design as a long-sleeve shirt. So, I had to get one of those as well. Next up in this post is something of a "dream" shirt. Around 1997 or so, whilst flipping channels on the TV, I clicked past a rerun of 1975 - 1984 TV show "One Day At A Time". The show, starring Bonnie Franklin, Mackenzie Phillips and Valerie Bertinelli dealt with a single mother raising her two daughters while juggling career and life. Not interested in the show, I continued flipping past. However, JUST before the channel moved past the show, a scene with a young boy speaking to one of the female leads popped onto screen. I could have sworn that the young actor was wearing a shirt that looked like it had the classic 1980's Dr. Strange comic logo on it! As fast as I could, I tried to return to the show, but by that time, the scene was ended and the character was gone. I've whipped up a quick mock-up to show you what I THINK I saw. The color scheme of the logo might not be accurate in my comp, but it seemed to be THAT logo! I have been searching for that shirt, or any clue to its existence ever since. Over a decade has passed since I caught that fleeting glimpse, and not one lead has presented itself. The show only has a DVD collection for the first season available, with no clue as to when or if the next 8 seasons will ever be released. With NO idea as to what episode I had stumbled across, from which season, even if I was able to access someone's private collection, that is one hell of a daunting task. Perhaps someone out there might be able to shed some light on this old mystery. Either way, it is one of my personal "grail" items - one that I will seek for my collection, either until I find one, or prove that no such item ever existed. While "The Quest" (as I've called it) for long-sought "Grail Items" can take many, many years, with dogged determination, insane detail-oriented search techniques and sometimes... the help of a good friend, the Quest can sometimes be fulfilled. Featuring the classic DOCTOR STRANGE logo which emblazoned the covers of his title from 1974 - 1987, this is not only nearly exactly what I mocked-up in my earlier description, but also the only Dr. Strange shirt to feature this logo at all (wherein all others that DO utilize a logo oft opt for earlier - or later - logos; all inferior to this one). I'm unsure of the licensee for this one. The label says it's a "Screen Stars" shirt, but Screen Stars were usually just the manufacturer of the blank shirts, and some other company would buy them in bulk and print on them for resale. 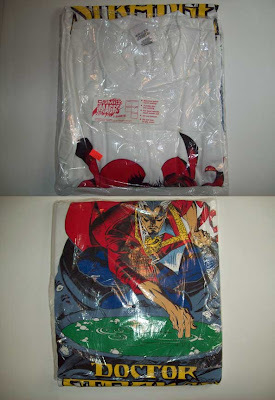 Was Marvel still releasing their own wares in the mid-1980's? As can be seen in the close-up / detail photo, the shirt has a copyright date of 1984. 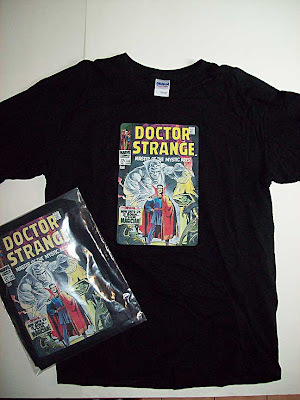 That makes it only the 2nd official Doctor Strange shirt - preceded only by the classic Steve Ditko illustrated shirt from 1965. It also helps to pinpoint some information about where I saw it - on the "One Day At A Time" tv show. Since the show was cancelled in 1984 - its 9th season, the episode wherein I saw it MUST be one of those final ones. Also helping to narrow it down a bit is that the full cast isn't even in some of those episodes. So, in time, I'll be able to find video of the show and - hopefully - put the clip here alongside the shirt. 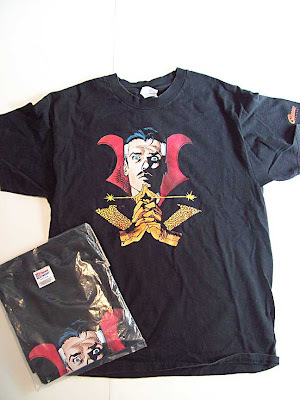 To give proper credit where due - it is once again, by the good graces of dear friend, Howard Hallis, that this uber-rare Doctor Strange garment finds its way into the magical wardrobe in my Sanctum. (This is the third uber-rare shirt Howard has either kindly stepped aside to allow me to acquire or obtained for me; the others were: the "Marvel Picnic" shirt, and the "Stussy" Dr. Strange shirt - both seen later in this post. 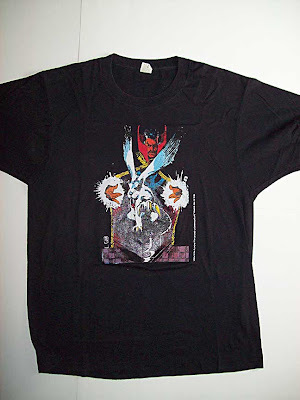 After the 1965 Ditko shirt, the earliest solo shirt to actually show Dr. Strange was this one released in 1987. The image is from a pin-up with artwork by famed illustrator, Bill Sienkiewicz. Also a "Screen Stars" shirt (the manufacturer of the "blank" shirt), the print company is unknown to me. 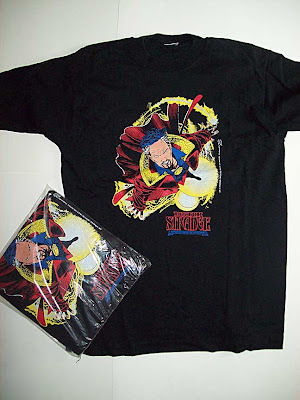 While Doctor Strange would appear in other shirts in the interim, his next solo appearance was this shirt from 1995 produced by COMIC IMAGES. For the sake of completeness in this catalogue, I'll also show the packaging for the items that I have still "NRFB" (Never Removed From Baggie). 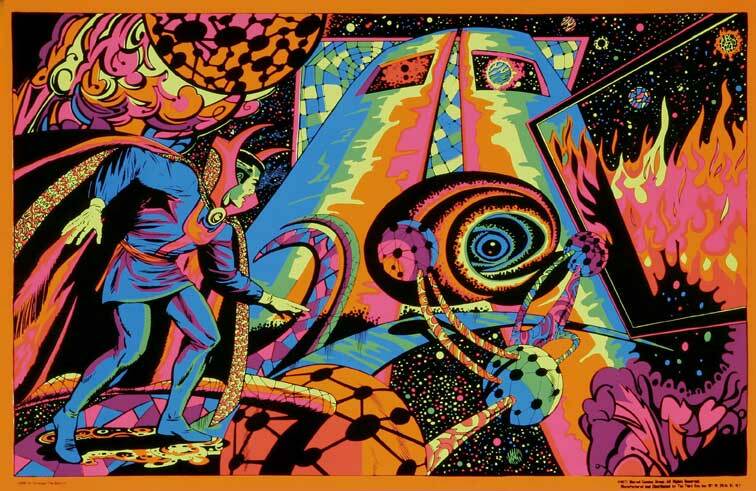 The artwork is taken from a rough draft of the cover of Doctor Strange; Sorcerer Supreme # 76 by artist Peter Gross. During this time in his "life", Marvel sought to make Strange more appealing to younger readers and thus gave him this extreme makeover. As you can see, the face and hair of Stephen Strange was cleaned up quite a bit from the version shown in the shirt. As a pure nerdgasm moment, I want to mention that I own the original artwork (color airbrush work) for this cover. It's a powerful piece in real life. Very rich colors. One of my favorite covers. 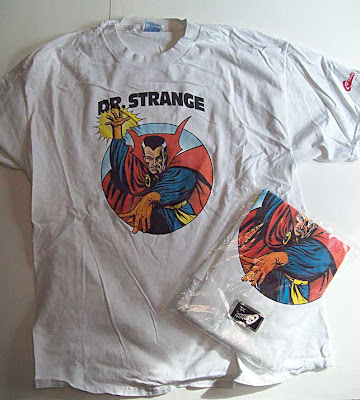 This was a red-hot time for Dr Strange apparel because within several months there would be more T-shirt love than any other time in his career. Aside from a few "team-up" shirts (which we'll look into in our next installment - tomorrow) there were a few more "solo" tees released in rapid succession. 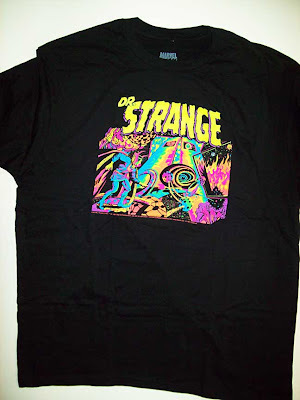 Very shortly thereafter, (within a few months) that "Kid Strange" look was tossed out and Marvel retooled Strange yet again, updating him as an urbane metrosexual for this late 1995 shirt. 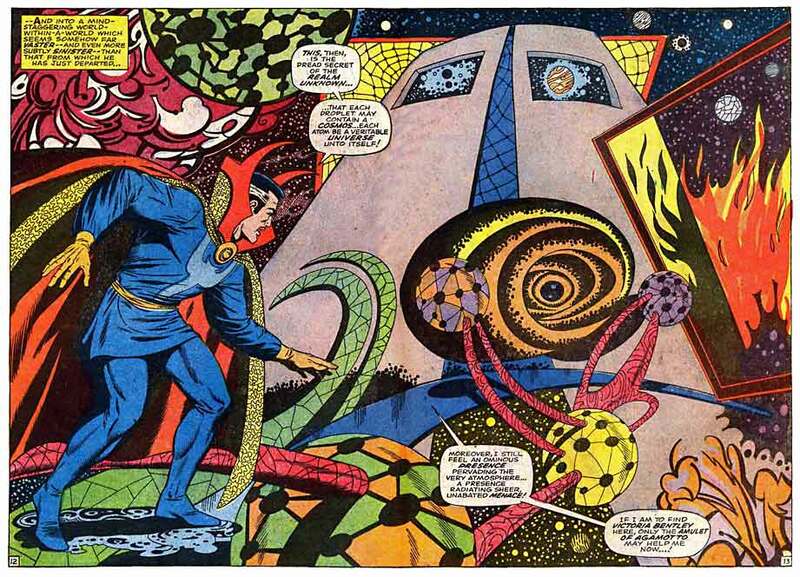 Doctor Strange; Sorcerer Supreme # 80. 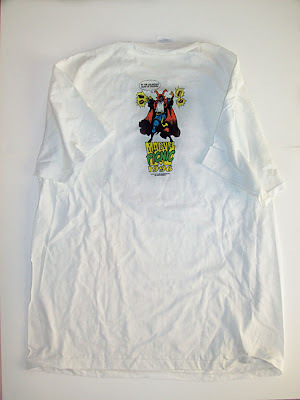 Within a few months of the previous shirt, in early 1996, Marvel and Comic Images released this next one. With artwork by Joe Madureira, this illustration was taken from a Dr. Strange guest-appearance in the pages of Uncanny X-Men # 329. This was a two-part story, and the following issue also produced a Doctor Strange image that would become its own shirt. However, it is a TEAM-UP illustration, and as such will be one of those we look at in tomorrow's installment. I say "nearly-one-of-a-kind" because, as you'll soon understand, there were probably several of these made, but not many (if any) others are around today. 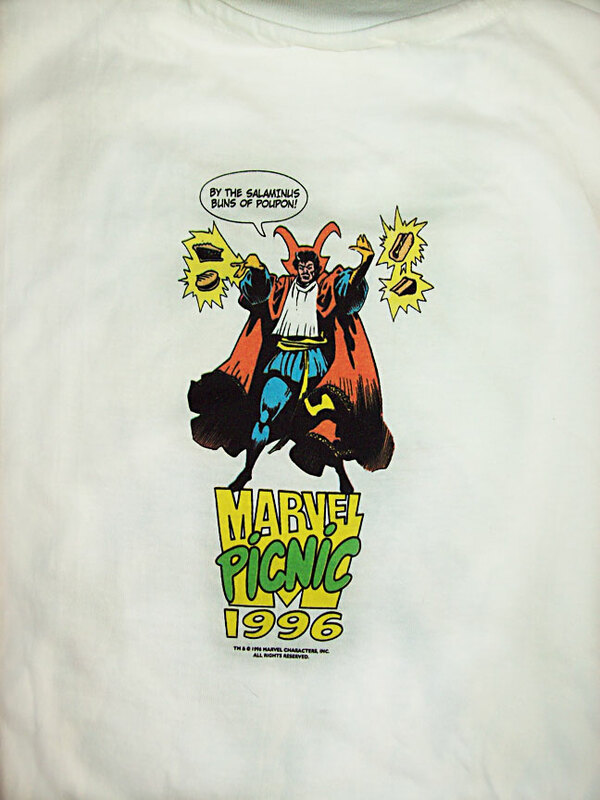 It was printed "in-house" at Marvel (or at least directly FOR Marvel, perhaps by one of their licensees, like Comic Images) for the express purpose of being the OFFICIAL shirt worn at the Marvel company PICNIC in 1996! Wait!? What the heck is THAT?!? OK. That's a tongue-in-cheek version of "EGO - the Living Planet" on the front depicted as "Ego - The Living PICNIC". Check it out. 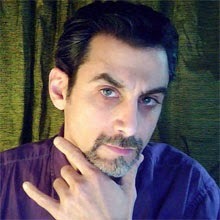 Although, THIS is what EGO really looks like. But that's not WHY it's in my collection. Oh, Heavens, No. "By the Salaminous Buns of Poupon!" DOCTOR STRANGE conjuring forth some eats while wearing a Bar-B-Que bib! "I want a hamburger... no, cheeseburger. 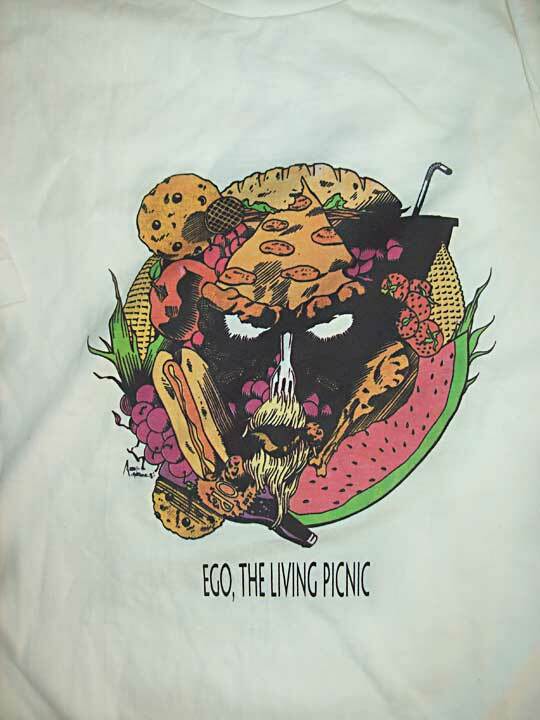 I want a hot dog..."
The artwork for this shirt is obviously done specifically FOR this occasion by artist KELLEY JONES. His style is unmistakable. It is odd that Jones would have drawn this since, by 1996 he was almost exclusively working for DC, only drawing a few Ultraverse and Marvel / Malibu crossovers as well as a few Marvel covers here and there. What is also odd is that Strange is shown in his traditional garb (bib, notwithstanding) instead of the "new romantic" look he had at the time, as evidenced by the previous shirts shown above. Stranger yet is that by summer of 1996 Doctor Strange's title had just been canceled! Here was a character without a home, so to speak, so, I guess it made sense for him to be hanging out in Central Park grubbing food from Marvel bullpenners. The next solo shirt would be more than a year since the one previous. By 1997 the t-shirt license was passed onto GRAPHITTI Designs. and this shirt was released, bearing the artwork of P. Craig Russell. The "What is it That Disturbs You, Stephen?" 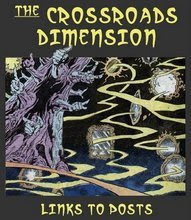 graphic novella by P. Craig Russell. Essentially, P.Craig Russel's magnum opus for Dr. Strange. Fun Factoid: The story in that deluxe edition was reworked, nearly panel for panel, from P.C.R. 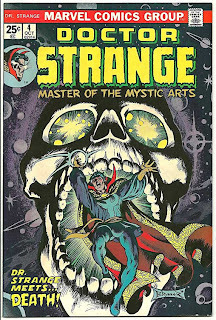 's much earlier work found in Doctor Strange Annual # 1. 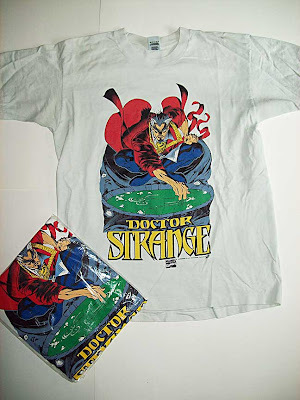 Not until 1999 would the next Doctor Strange "themed" solo shirt be released. This time bearing not an image of the good Doctor himself, but instead, a variation on the "demonic" symbol that emblazons his tunic. Doctor Strange; Flight of Bones mini-series. This iconographic symbol was only used in one other body of work, for the original SENTRY mini-series event. 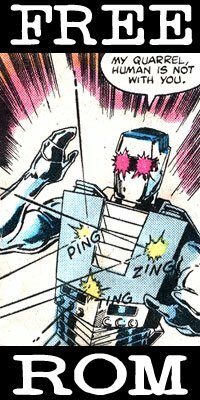 What complicated matters was that while it was colored RED (as seen on this short) in the "Flight of Bones" series, it was colored light blue (like Doc's original design) in "Sentry". 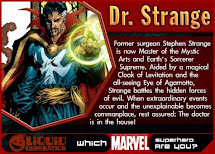 While it was seen on a few "HeroClix" toys of Doctor Strange, afterwards, the design was nearly ignored by future artists, and variations of Strange's classic "demon" symbol would return. 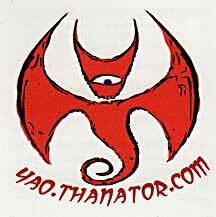 As seen in the comments section, comics scribe ROB WORLEY wrote in and reminded me that this symbol was also used in the (sadly, aborted by Marvel) Young Ancient One tale as seen (only) in EPIC Anthology # 1 from 2004. There was also a VERY COOL mail-in offer for free Y.A.O. tattoos, which bore the symbol. Needless to say, I gots me some of those. but the thanator.com part is, and is the home of Rob's works. This next shirt was something of a mystery to me. Still is, really - because it is the only one like it that I have ever seen. It's an official release, but was an early production of the newest Marvel license-holder; "MAD Engine", and was seemingly available in limited quantities around 2005 or 2006. The printing style is "distressed", which was / is fairly popular - although, truthfully, I am not a fan of "pre-damaged" print jobs. Luckily, the distressed nature of this piece isn't excessive. 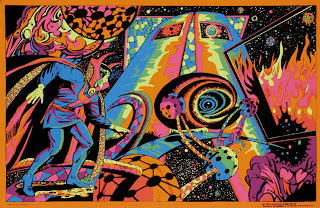 The artwork, by Steve Rude, was among some of the character designs that he had drawn for use with licensed ancillary products. 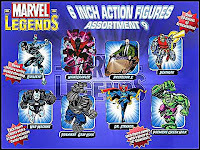 Aside from this shirt, this pose was used for a few other items, a small representation of which is in a giant Marvel Universe group poster (but, sadly, he's barely a dot on the far horizon), also the Doctor Strange "Battle Dice" figure, as well as the promotional poster for the Marvel Legends "Galactus Series" assortment. An excellent piece of work (as are ALL of Steve Rude's works) this design seems to be "last year's model" and has seemingly been discontinued from Marvel's licensing. 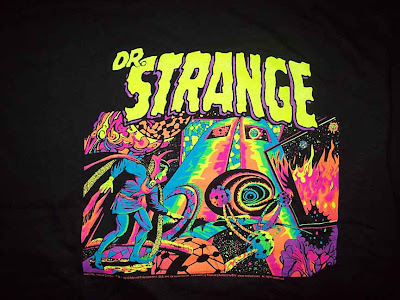 Personal factoid: I discovered the existence of this shirt while doing one of my usual internet searches for any and all things Strange - and came upon a curious YouTube video. 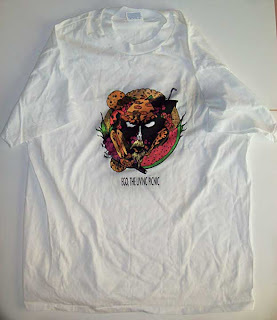 In the video, a guy was wearing this shirt, one that I had never seen before, and he was involved in some wrestling match while wearing it (and seemingly calling himself Dr. Strange). I was transfixed. A shirt that I had never seen. A design that I could not place. A lead with only the slightest of clues. I HAD to find that shirt. For several months I hunted down any leads that I could find about the shirt or the image that it bore. After scouring nearly my entire comic collection to find that image - scouring to no avail - I eventually decided to try and make contact with the dude in the vid. It took over a year of on again, off again attempts, but eventually, we were able to make a deal. Luckily, the shirt had only been worn a few times, was in excellent condition and was freshly laundered by the time I received it. Even though this post is quite nearly a full year since I told him I'd hope to feature it on the blog, allow me to present the video that led me to this shirt. Presenting: Mike, aka; "Sunshine", aka; Owen Blaze. Professional student, free spirit, drunken wrestler. 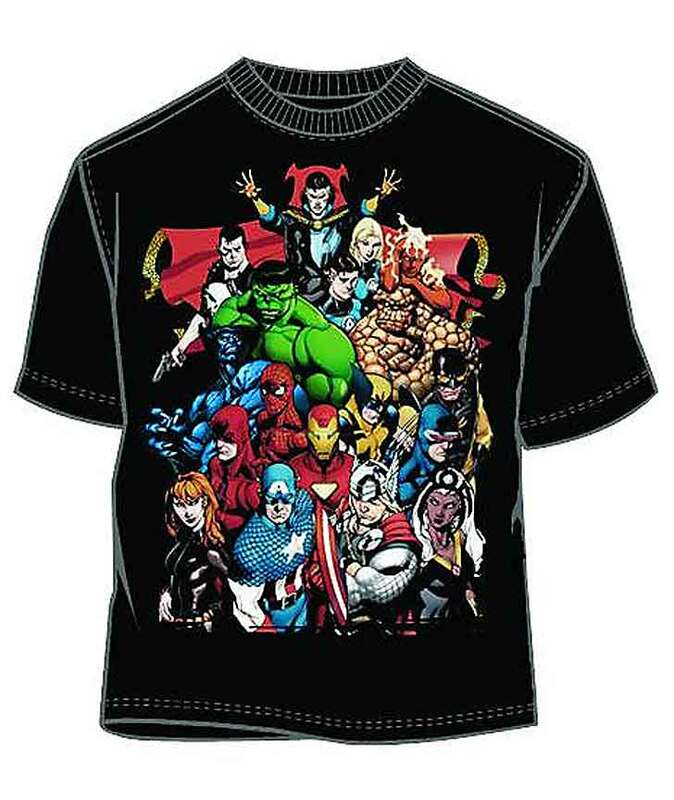 Like several items in my collection, there are MANY knock-off / bootleg shirts out there that feature Marvel characters. I've seen several Dr. Strange shirts over the years that I passed on because they were merely "OK", and since they weren't official, I could walk away. Artwork by Dan Adkins to what is my favorite comic book cover OF. ALL. TIME. 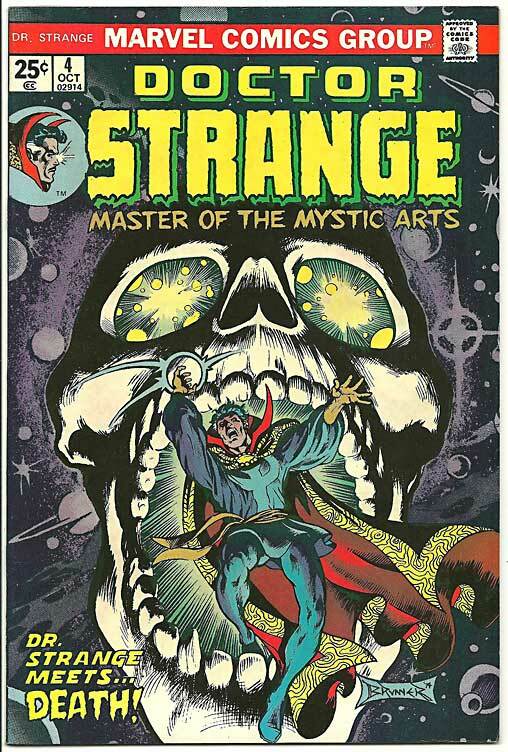 DOCTOR STRANGE (first series) # 169. No need to show the actual cover since it is right there on the shirt. However, info on that short-lived series can be found [HERE]. 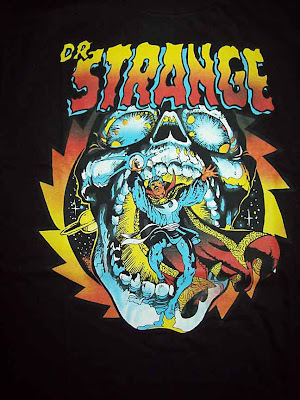 Next is a shirt that reproduces one of my all-time favorite Doctor Strange covers. 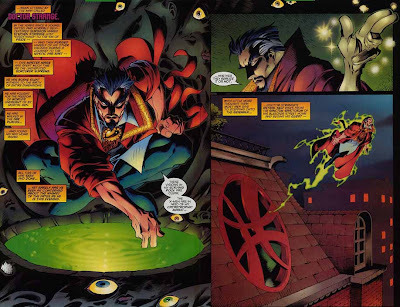 Doctor Strange; Master of the Mystic Arts # 4. Despite appearances, it is NOT an actual reproduction, but a re-drawing of the famous cover art by fan-favorite artist Frank Brunner. Check out the differences in line quality and technique. It's almost as if a Spanish or Filipino-style artist (like Alex Niño) inked over Brunner's pencils. Below is the cover art original with Frank Brunner artwork. 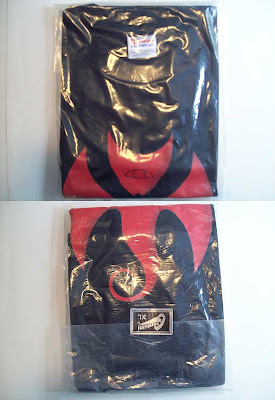 Why the Mighty Fine shirt company felt the need to redraw the artwork is unknown. Suffice it to say, it is STILL 100% awesome! My only complaint? And it is a minor one... the use of the 1960's / 1990's Dr. Strange logo. It's my least favorite of all of the Doctor Strange logos. I would have been thrilled if they had used the 1970's style logo present on the comic. Next up, another late 2010 release, this time from IMPACT MERCHANDISE, sees the reproduction of an old-school Doctor Strange image. 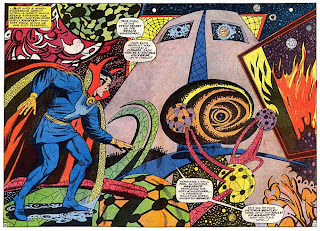 With artwork by Dan Adkins, this image is originally from the pages of Doctor Strange v1 # 171. 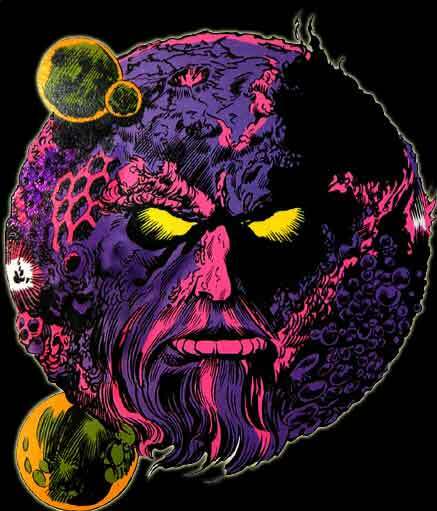 However, having been reworked in 1971 as a black light poster, post card and jigzaw puzzle by THIRD EYE productions, it is from THIS incarnation that the image was taken for use on this shirt. Howard Hallis; artist, bon-vivant and Dr. Strange fan of the Nth degree, was contacted by the company because they saw an image of the print on the website for his personal collection. Asking him to provide a high-resolution scan of the piece scored him some free shirts. 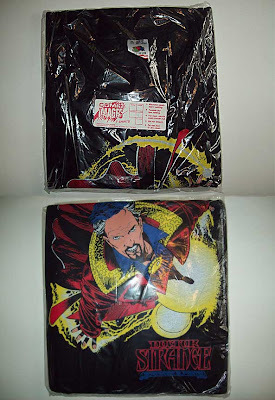 Continuing the tradition of Doctor Strange "solo" shirts, is this shirt that is something of a rare item, due to several factors - all of them mildly annoying. 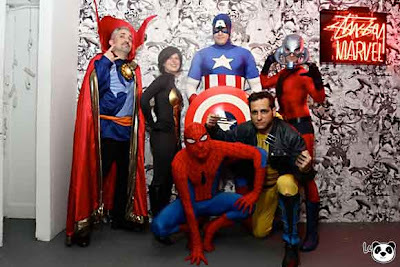 Produced as a LIMITED EDITION SERIES of shirts, renowned indie clothing brand; STUSSY, grouped many underground artists with their favorite MARVEL characters for the STUSSY x MARVEL project. Hosting an impressive assembly of talent, including the likes of; Will Sweeney, David Shrigley, Bill Plympton, Gary Panter, John K., James Jarvis, Todd James, Mister Cartoon and Noah Butkus, working on such characters as; Doctor Strange, Captain America, Silver Surfer, Human Torch & Crystal, The Thing, Ghost Rider, Punisher, Spider-Man, Wolverine, Mystique, She-Hulk and others, the STUSSY x MARVEL project produced a couple of waves of product in April and May of 2011, and all items were available only via ordering from Stussy and only for a very limited time. This first item is the DOCTOR STRANGE shirt showcasing a design by Noah Butkus. "Oh, man... I shouldn't have jokingly ordered 'magic mushrooms' on my pizza." Doctor Strange- meditating in the lotus position, conjuring the Stussy logo amidst demonic creatures. My shirt is on a plain white tee. Other color choices included green, blue, red and black. Printed on the inside along the bottom seam is this code that dates the garment to April 16, 2011 (a week after my birthday) - along with the Stussy logo and all designed to emulate the old Issue/ Comics Code Autority box from nearly every Marvel comic in the 1980's. One "strange" thing about this shirt is that the really cool image of Dr. Strange is ON. THE. BACK of the shirt. So if you're like me, and wear an open, unbuttoned button-down shirt (long or short sleeve) over a tee, no one can see the design on the back. THIS photo here is of the FRONT of the shirt, which only displays a small, newly designed "logo" on the left breast. 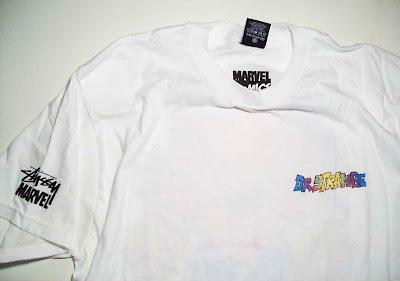 One of the aforementioned "annoying" factors of the Stussy x Marvel project is that many of these shirts also came in an assortment of shirt colors. Thus, if you are a nerdy, completist collector-monkey, like myself, you would find yourself hard-pressed (and broke) if you tried to get one in each shirt color. Still, I'm not THAT bad with my mania (much... anymore...) and am quite content to be MORE than satisfied with my single acquisition. ESPECIALLY, since it came to me as a gift of sorts, from my dear friend, and fellow Doctor Strange fan / collector - Howard Hallis! Turns out Howard is a well-known Doctor Strange fan over on the West Coast, and he was tapped to dress up as Doctor Strange for the launch party for these shirts. So, when they presented him with this shirt as a gesture of thanks (and also as his payment?) he was magnanimous enough to send it to me since he knows my Doc-garment collection is 2nd-to-none. Not to worry friends of fairness and barter-system buddies, as I promised Howard a special garment in exchange (something that will be revealed here in a forthcoming post). 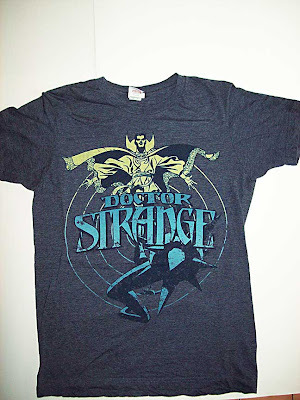 With the exception of the last couple of officially released shirts, there doesn't seem to have been any more recent "solo" shirts for Doctor Strange. Until his return to the role of Sorcerer Supreme - or a movie deal - that status might not change any time soon. 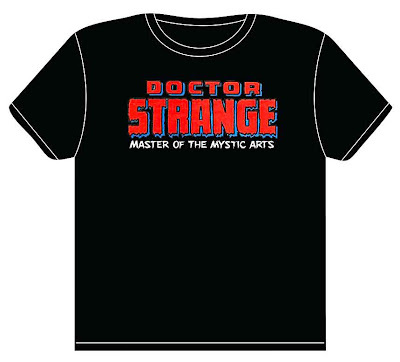 There HAVE been some new Doctor Strange "solo" shirts as of late, and they will be presented here - in an update - soon! He has also been featured quite a lot, and fairly prominently, in recent years, on more than a few shirts of a "TEAM-UP" nature. I might be wrong, but for my tastes, NOTHING goes better with a "t-shirt/dress" than classic black leggings. Also, a belt of some sort is a nice touch. In the case of a DR STRANGE shirt/dress, perhaps a sash-belt, much like his own. But, of course, I could be wrong. 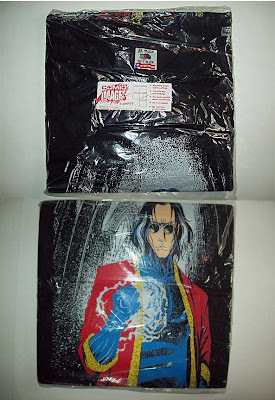 Also never saw the Comic Images "John Lennon Doc" shirt (You own the artwork Sanctum? You need an original artwork post ASAP!) 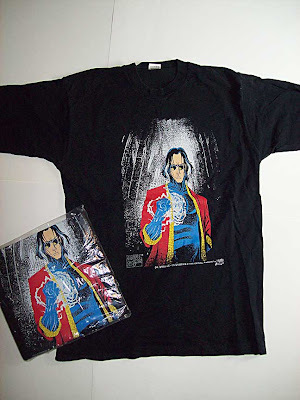 or the Comic Images "Conjuring" shirt below it. As for the Mad Engine shirt you got from the wrestler, that story and video are what make me feel that you truly are the greatest and most dedicated Dr. Strange fan on the planet and feel that should be duly noted here. Dude... Even the Marvel Legends promo poster blows me away. I thankfully have all the other shirts you listed here, although the long sleeve Graphitt designs one is the recent reissue, not the original release from the 90's. I go through so many of the white short sleeve ones that I should just buy them in bulk. It is kind messages of bro-love appreciation like that which make all this worthwhile! I've said it before, but the fact that a Strangephile such as yourself is impressed (or is able to see things that he's never seen before) is a thing of wondrous beauty! That means I'm doing my job here. Dude... I've been dying to post this series since day ONE on the blog. So glad that it finally paid off (more than one year into this blog) and I was allowed to share this goodness with everyone. But there's more to come. An "original art" post will happen one day, but unlike YOU, I really don't have too much in original art. A few sweet items (and a few surprises) but that'll have to wait for another day. Hey man! great blog post. Just wanted to say that Tony Harris' Flight of Bones demon emblem appeared in one other story. It was in "Young Ancient One" which I wrote for the Epic line in 2004. In fact, the title of the story was "The Mark of the Ancient Ones" and that demon emblem was, in fact, the titular mark. Only the first issue was published. The "head" part of the mark appears in extreme close up on one panel only. 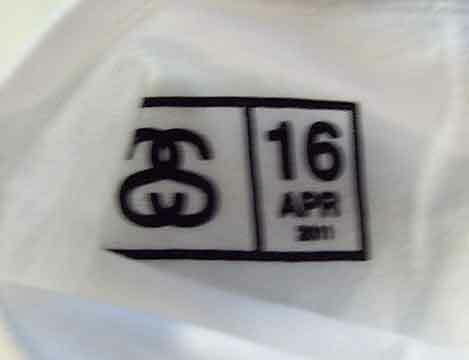 Later issues would have revealed the mark in full. How could I have forgotten that Y.A.O. story? That Epic line was to have been VERY COOL for we Doc fans. Both YOUR "Y.A.O." story (by yourself and artist Andy Khun) and the "Strange Magic" tale (by Jason Henderson & Greg Scott) would have been awesome additions to the Dr. Strange mythos. While Sophia Strange (the supposed daughter of Stephen and Clea), as seen in the "Strange Magic" tale was ignored by Marvel (although it was unofficially continued in a title published by Image, "Sylvia Faust"), your YAO was absorbed into the Marvel canon via the Official Handbook entry for the Ancient One. Despite the tale being left untold. MANY THANKS for writing in. The story behind that last shirt is hilarious. You are so my hero. I have been looking for a t-shirt like those ones, however I don¡t know where they are been sold, because I have not found them yet. I like Black Dr. Stranger, so I need to get it as soon as possible. 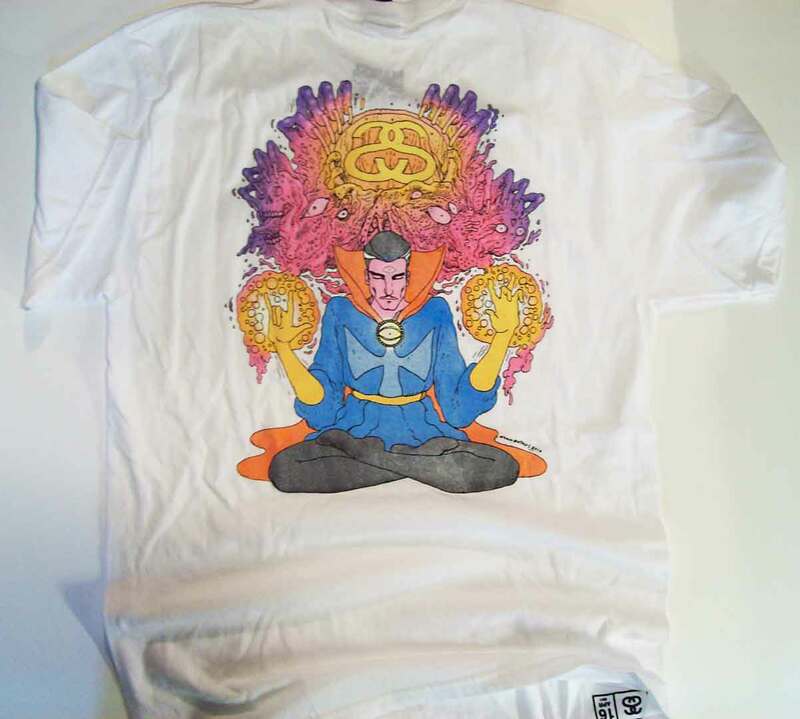 How have you found so many t-shirts that incorporate Dr.strange?! I've found very little online, none of which i even own. Thanks for the good read! I found a Dr. Strange t-shirt at Game Stop called Strange Profile by Marvel Size XL. I love it! Anyone willing to sell that 1997 P Craig Russell tshirt from "What is it that disturbs you Stephen"? So... Expect more from me soon! BUT, I've also been lax in my replies to comments! And lastly, I have no interest in selling any of my collection as of yet.